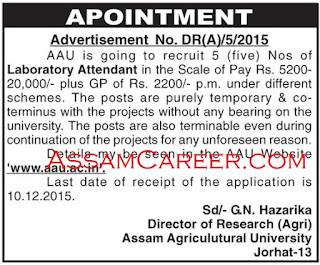 Applications are invited from eligible candidates for filling up of the following posts under different schemes in Assam Agricultural University, Jorhat. Note: These posts are purely temporary and co-terminus with the projects without any bearing on the university. The posts are also terminable even during the continuation of the projects for any unforeseen reason.